The Biltmore Hotel, built in 1925, is a large Spanish-style structure with a tower modeled after the Giralda tower in Seville, Spain. Constructed on 19.8 acres, the hotel has opulent interiors, courtyards, a country club, winding canals, formal gardens and a golf course. Built by George Merrick, the developer of Coral Gables, the hotel was intended as a fashionable winter resort for the socially prominent. The Biltmore Hotel helped influence the architectural styles of Coral Gables and Miami with its Mediterranean Revival architecture. The hotel also contributed in large part to the tourism boom in southern Florida in the opening decades of the twentieth century. After serving as an Army hospital during World War II and later a Veteran's hospital, the Biltmore has been restored to its former glory and is again a functioning hotel. The Biltmore Hotel is at 1200 Anastasia Avenue in Coral Gables. 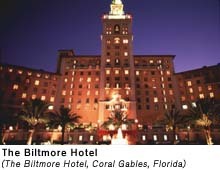 The Biltmore Hotel is a Historic Hotels of America member, a program of the National Trust for Historic Preservation.